When children visit Wat Tha Ka Rong in Ayutthaya, they walk past exhibitions detailing local fish and cultural displays of ASEAN partners. Then they walk straight to the robot. Although it’s not clear what was the intended educational value of the robot, which is indeed pretty sweet looking, he’s become a popular draw to local youth. The monks have even nicknamed it “transformer,” though it’s pieced together from bits of metal and unlikely to reconfigure into anything more exciting than a robot made from bits of metal. 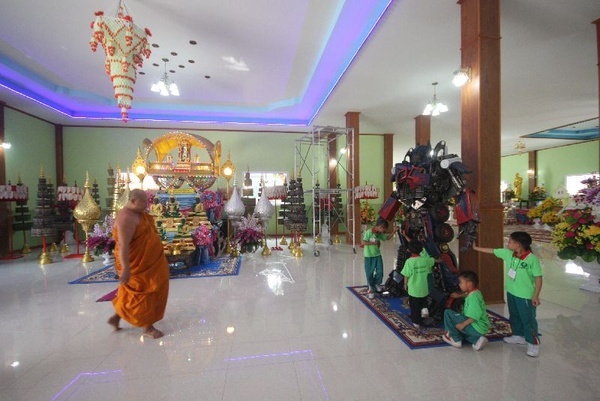 Children haven’t been coming to the temple, said Abbot Phra Kru Sutthipanyasophon, who hope the robot and exhibition will pull them back in.